Wetland and riparian areas in the desert Southwest are of vital importance. Less than 2% of all land here is considered riparian. These highly complex and highly productive ecosystems provide many critical functions, including flood mitigation, water storage, water filtration, and wildlife habitat. Despite the system integrity inherent in a complex and diverse ecosystem, numerous forces constantly compete to alter this natural balance. Floods, invasive species, and human development all typically threaten the natural dynamic equilibrium inherent to these systems. These forces often succeed at disturbing the natural balance, leaving the damaged wetland highly vulnerable to even more degradation. 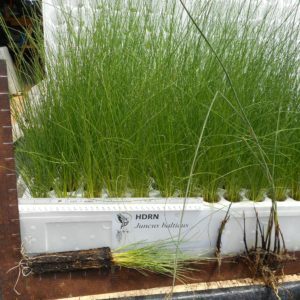 While seeding and passive, natural revegetation are the most common methods of restoration, carefully selected and specially grown deep rooted native riparian plants provide both a catalyst and an insurance to the success of your riparian restoration project. All our potted plants are deep cell rooted, bio-inoculated, and polymer protected to best insure your natives investment. Carefully sourced ecotypic seed guarantees healthy genetic diversity and our select varieties ensure vigorous, highly transplantable specimens. Our grow locations at 6100 and 5200 feet elevation on the western slope of Colorado provide excellent conditions to create the hardiest, healthiest native riparian plants available. See our Species List for details or just fill out our Project Questionnaire and we will respond promptly. Let us know how we can assist you with your riparian project. We are here to help and have excellent Resources. We applaud and support your interest in healthy native ecosystems.